Before I dwell on this topic related to brokerage charges I can assure you after you have gone through the writeup you will be able to come to a firm conclusion that you are being overcharged by these brokerage firms and thus it is your every right to haggle them for a good brokerage rate as a penny saved is penny earned. Undertake the direct encounter of your brokers by showing them the brokerage charges in Reliance Money which is an aggressive player to brokerage charges ICICI which is a slow and steady winner. However off late it has come to notice that ICICIdirect has also improved and one can recheck the same as they keep coming with innovative schemes near festivals and try to bind you with minimum commitment of trade value. We have studied a number of models and have given due cognizance to brokerage charges for Sharekhan, Motilal Oswal, Reliance Money, SBIcap and number of operators in the field. The below analysis has been arrived at by virtue of personal experience and is an individual opinion and is in no way to defame any brokerage house in India as every entity has its pluses and minuses. I have the opportunity of having been associated with a number of online trading platforms as a user or as an analyst.Time and again I have seen this question cropping up regarding the best online platform and for the sake of a beginner or a layman and to put all the doubt to rest, I hereby give my assessment on the sites accessed/used by me. (a) Indiabulls: I can say with authority that "Power India Bulls" software provided by Indiabulls is ultimate and I have not seen any other software matching all the capabilities including updated live chart for any stock.The brokerage is also competitive to let a customer survive and take back something to home.The relationship managers and branch heads are cooperative and atleast I can say the same for Ludhiana branch where I am holding my account. Offlate Indiabulls is also going to introduce the security token system for online trading wef 29 Oct 2009. (b) ICICIDirect Site is suitable for an individual who intend to hold scrips for a longer duration and number of transactions is limited.This site is useful for those who are not worried about speed of platform and use limit orders.I can say with authority here that the site is definitely not suitable for day trading unless these ICICI personnel intends to change the operating platform.If you can "Fill It and Forget It"(referring to orders) type guy similar to Honda ad type then the site may be suitable for you. The brokerage charged is highest among all the available online platforms. Moreover they have grown their boots and one may not be satisfied with their performance. (c) Reliance Money : It is a new player in the field and has to establish itself before any final verdict can be passed.However be wary of their hiding details. They are charging on the basis of a card system where one has to buy the credit initially and thereafter all trades are available at very reasonable rates. However I was not happy with the speed of the platform. Reliance money has a security token system where a key is provided to you and you have to enter that key data every time one logs in the online trading platform. (d) Indiainfoline(5 paisa) :The site has to improve on its relationship with its customers and definitely has to provide a competitive brokerage to its customer. They never responded to a number of phone calls sent through our office. (e) ShareKhan: Definitely a good site with good research but only hiccup is their high brokerage linked to turnover. Remaining all other accounts of other companies are almost on equal footing with warying brokerage plans.. So if you are the one ready to jump to open an online account then consider that speed of internet is an important criterion for any platform to function. Thus keeping all consideration in mind IndiaBulls perform the best as at one or the other stage I operated above trading platforms and finally settled for Indiabulls with Powerindiabull feature. NOTE : This is my personal observation that India Bulls is the best and in no way I am promoting the site.Its only my way to speak for the good work being done by the site as I never had any problem in terms on speed,payment,delivery of the scrips and of course the customer relationship managers to name a few.Its just my way of saying "Keep up the good work INDIABULLS community". I am no where eulogizing the site and thus please select your trade platform with due diligence else you will be filling the pockets of your broker. 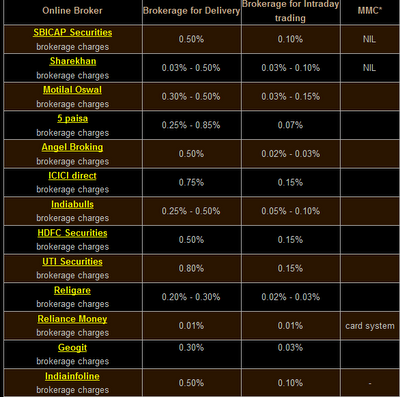 The brokerage rate can be also viewed pictorially and same will provide an ease of accessment as we are undertaking the brokerage rates comparison for SBI Cap, 5 Paisa or Indiainfoline, Sharekhan, Motilal Oswal, Angel broking, ICICI direct, Indiabulls, HDFC securities, UTI securities, Reliance money, Geojit and now a new player has come on the scene is vantage trade which can also be checked as it aggresively marketing its products. One can even check out the writeup on brokerage charges comparison to make a better and informed decision.